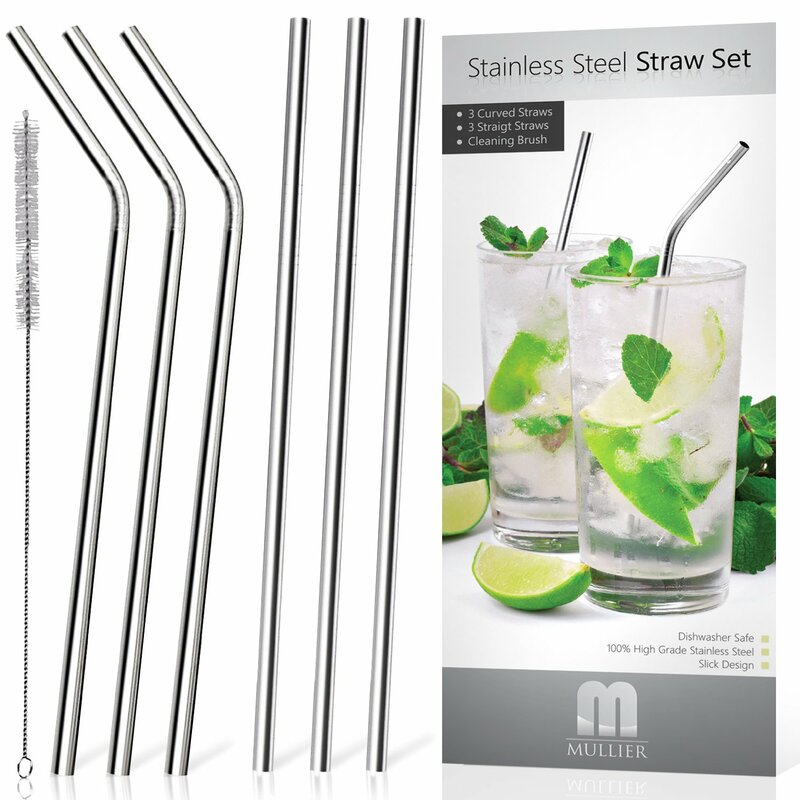 Home › Home and Kitchen › Mullier Set Of 6 Stainless Steel Reusable Drinking Straws And Cleaning Brush ..
Mullier Set Of 6 Stainless Steel Reusable Drinking Straws And Cleaning Brush .. PERFECT FOR STAYING HEALTHY: the Laminas stainless steel drink straws don't hold onto bacteria like their plastic cousins, so your long drinking straws will be a lot safer for keeping you fit and healthy. NEVER THROW THEM AWAY: If you were concerned with staying healthy, you would throw a plastic straw away after each use. These reusable drinking straws will last you a lifetime, and will save you so much money. LARGE PACK OF 6: You'll get 6 drinking straws, plus an additional cleaning brush. It means there will be enough for the entire family, and because they're made from stainless steel they won't be easily broken. A MASSIVE 8.9-INCHES LONG: With reusable straws drinking with them all the time is easy because they're so long. You will find they're the prefect size for anything you want to drink out of, and the brush means they're simple to clean. CARRY THEM AROUND ANYWHERE: Due to the long drinking straws being unbreakable you can carry the long straws camping, to the beach, or hand them out at parties. They won't even rust or end up with horrible scratches on them. Click 'Add to Cart' now! THROW AWAY YOUR PLASTIC STRAWS RIGHT NOW Stainless steel drinking straws arethe future! It makes perfect sense when you think about it. Plastic strawsshould have been banned decades ago, and not only because they're very harmfulto the environment. Why would you not want a straw you could use a thousandtimes without worrying about bacteria? They're dishwasher safe and will takeseconds to wash, plus you've got to admit they look a hundred times morestylish. You'll look cool while sipping on your fancy cocktails. The steeldrinking straws make perfect sense! You get 6 in a pack, so unless you have ahuge family there will be enough for everyone. They've also been carefullydesigned by Laminas to guarantee they'll work with any special concoction youmight be drinking. The fact they won't rust or bend means you'll never need toreplace them, which will save you even more money if you buy plastic drinkingstraws all the time. Take them when you go camping, hiking, on holiday, andeverywhere else with you from now on. Are you finally ready for a reusabledrinking straw that: - Will take seconds to wash while killing every last bitof bacteria. - Are more environmentally-friendly than any other straws onearth. - Will keep freezing cold drinks cooler thanks to the stainless steel.- Means you don't need to rush out to the store when you desperately needstraws ever again. - Are perfect for all occasions no matter what age yourfamily members are. Now you know reusable stainless steel drinking strawsexist, so you can finally say goodbye to annoying plastic straws. Click 'Addto Cart' now!